» View other lodging options in Idaho Falls. Register for InIdaho.com's email travel specials and information! 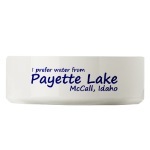 Purchase your Idaho pet water bowl here. These listings may allow a pet with notice made at time of reservation. Pet fees or deposits may apply.